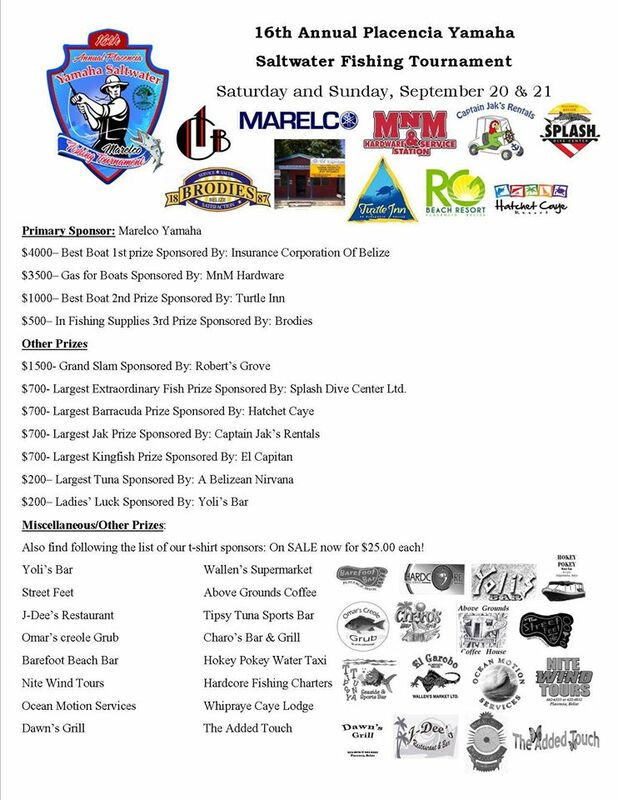 17th Annual Placencia Yamaha Saltwater Fishing Tournament!!! The 17th Annual Placencia Yamaha Saltwater Fishing Tournament takes place on the 19th & 20th of September, 2015. Stay tuned for more updates in the coming months! Reel in the fun this September in Placencia! Join anglers from Belize and around the world on a two-day adventure for some of the best inshore and deep water fishing in the country! Placencia Lobsterfest 2015!!! BOOK YOUR ACCOMMODATIONS NOW!!! The Placencia Lobsterfest began in the summer of 1998. The Placencia Chapter of the Belize Tourism Industry Association (BTIA) recognized a need to improve the local economy and decided to create an event that would attract visitors from all over world to Placencia Village. They planned for the event to coincide with the start of the Placencia Fisherman’s Cooperative annual Fisherman’s Day festivities and with the start of lobster season. It was in June of 1998, at the Placencia fishing harbor with just a single table, the only party represented was The Green Parrot Resort of the Maya Beach Community from the northern Placencia Peninsula. They served lobster bruschetta and the proceedings went forward rather quietly. The small gathering invited the public to play a few makeshift carnival games to raise funds for the Placencia Chapter of the BTIA. But the humble event was successful, drawing enough patronage to double in size two years successively. In the summer of 2000 The Placencia Lobsterfest had grown considerably, stretching down the beach beyond the docks and attracting foreign visitors. Local artisans of every stripe and performers came to contribute to the atmosphere. Lobsterfest was well on its way to becoming an annual event to rival those of New Orleans. To keep up with the exponential growth of the Festival, the Placencia BTIA collaborated with the village council and moved the event to the Placencia Village Beach Front. Now there was ample room for the event’s 60+ booths and carnival games. Visitors enjoy the full range of Belizean sea-food treats and delicacies such as lobster fajitas, grilled lobster, stews, pies and an array of novelty confections. Guests and participants enjoy the thrill of the Lobsterfest raffle, a fully stocked bar which is operated by the village council, terrific live music acts- all of which come together famously to create a three-day event, summertime celebration. Since 2011, the Placencia BTIA has incorporated the Placencia Fisherman’s Saltwater Tournament in order to make room for the Southern Environmental Association’s first annual Lion-fish Tournament as a response to the environmental threat this invasive species presents to wildlife throughout the Atlantic seaboard. This, like the La Ruta Maya river racing event has become not only a massive celebration, but it is also a great event for environmental conservation and serves as an example to the world of what can be achieved by combining grand festivals with conservationism. Scheduled from June 19 -21, 2015, the Placencia Lobsterfest is a grand celebration of the opening of the lobster season in Belize attracting thousands of local and international visitors. The event is organized by the Placencia BTIA and the Placencia Village Council and has long been a traditional mainstay of Placencia’s economy. Throw the cast net – A Placencia Lobsterfest original. Throw the cast net over the sand and try to scoop up a schilling! Reel in the kayak – That’s right! Grab a fishing rod and reel in a kayak with one person on board to shore! Fly fishing on the beach – Throw your fly fishing rod and land your fly in the center of a circle drawn in the sand. If you can do this, you are a real champ! This is the most popular event of the season in Placencia so we hope to see you there! Treat Yourself to a Much-Needed Break From Uncle Sam!!! 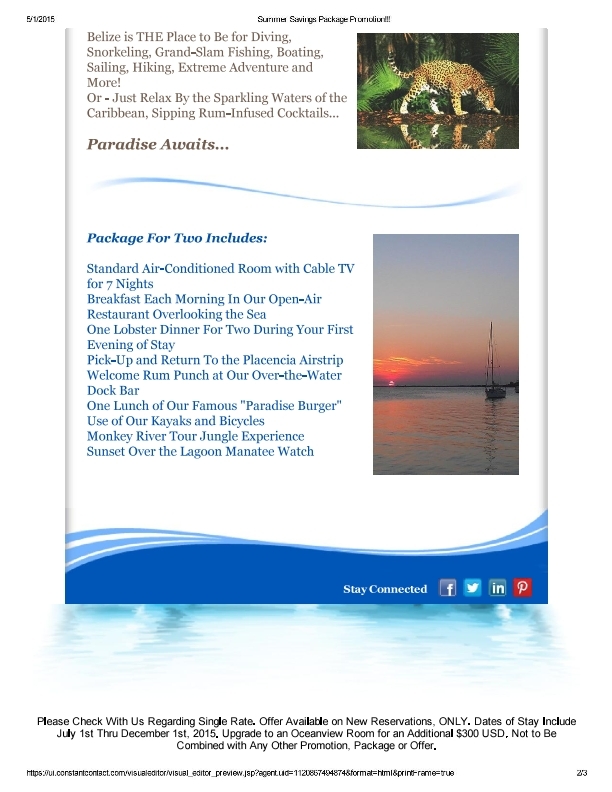 Enjoy Low-Season Rates During Any Stay from April 15th to the 30th, 2015!!! Must Mention This Offer at Time of Booking. Not to Be Combined with Any Other Special Offer, Package or Promotion. Sidewalk Arts & Crafts Festival 2015! Stay 3 or More Consecutive Nights & Receive High-Season Accommodations for Low-Season Rates! Reservation Must Include February Dates of Either the 13th, 14th or 15th. NOT TO BE COMBINED WITH ANY OTHER OFFER OR PACKAGE. Book Now and SAVE! Place a Reservation for Any Stay During December 13th—18th, 2014 and Receive a 15% Discount Off Our Regular Room Rates! No Minimum Required! Friends ~ As we Welcome the Start of the 2014 Holiday Season, Please Join us Thursday, November 27th at 2:00 PM for Our Annual Thanksgiving Dinner! $40 BZD per Person... Everyone is Welcome! Come Help Us CELEBRATE! Hope to See You There! Visit Placencia and explore Belize with Paradise Resort learn about our diverse cultures, language and ethnic groups. Belize is mostly English speaking, warm, friendly, and relatively inexpensive. Make chocolate the way the ancient Maya did! Let our Knowledgeable & Experience guides lead you on the best, DIVING, SNORKELING, FISHING, HIKING,BIRDING, TUBING & CAVING EXPERIENCE Belize has to offer. To make your adventure an unforgettable experience choose Paradise Resort for your rooms and tours!!! 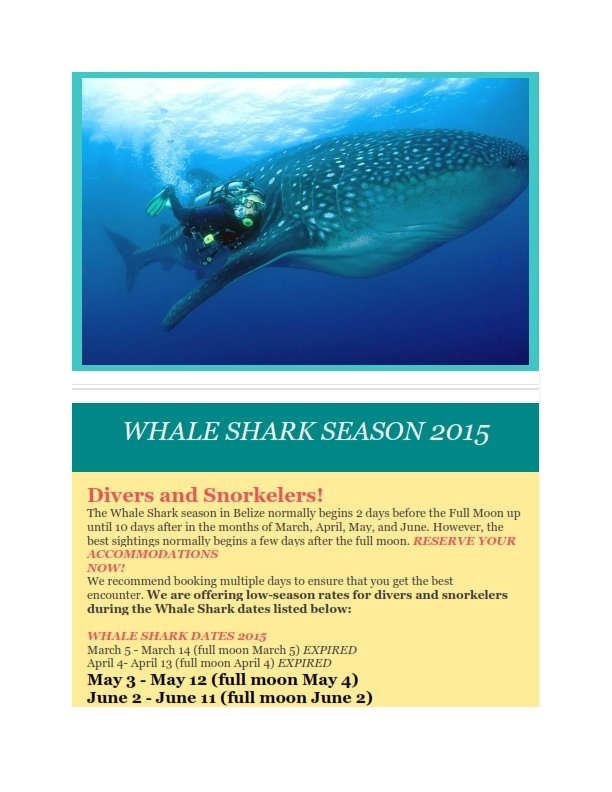 To avoid being left out book your Whale Shark dive or snorkel tour early. It is that time of year again eveyone where Lobster is on everyones mind. That also means food, fun, friends coming from all over. Not to mention the Lobster cmpetition and Lionfish Tournament going this weekend as well. Come on out to Lobsterfest and stop by our booth and try some new twists on old favorites!! Hope to see you there!! February brought us lots of wonderful visitors from all parts of the globe. Families came from as far away as New Zealand and Italy. And some just came down from San Pedro or Belize. Paradise Resort's staff enjoyed meeting and serving the young and and the not so...young. Creating special meals for guests with special dietery needs is just one of the services we provide for our guests at Paradise Resort. Our rooftop dining area was the perfact place for a soon to be groom to plan a surprise dinner for two for his soon to be bride during Lover's month. Also during this month the new ziplining in Silk Grass Village opened and the staff as well as numerous guest of Paradise Resort visited the new attraction. The videos that were taken showed everyone having a great time. So from land to sea Paradise Resort staff will be more than happy to help you plan your adventures while visiting Belize. DON'T FORGET EVERY THURSDAY FROM 6-9pm IS TACO NIGHT AT PARADISE!!! Paradise Resort is preparing for Whaleshark season. March 8th is the first full moon that will offer an opportunity to see the whalesharks this season. Be sure to book early. As spaces are limited. Don't miss your chance to see the massive creatures in their natural habitat. Paradise Resort was bright with with artisitct flavor over the weekend. Placencia Village just wrapped up the 9th annual Placencia Penninsula Arts Festival. And what a success for all involved. Today the boss is off to check out the new zipline in Silkgrass Village. Last day of Lobster Season in Belize is today. Our guests are out catching fish on our dock. Last big catch was a 70lb Tarpon off our dock. Unusual for the fish to caught off our dock. But what an adventure for those of us to watch. 13th Annual Placencia Lobsterfest 2011! PARADISE HOTEL HAS ROOMS LEFT, BUT THEY ARE GOING FAST! Get ready for the 13th Annual Placencia Lobsterfest 2011 – June 24th, 25th, & 26th. This year’s festival once again promises to be a spectacular 3-day weekend. The Placencia Chapter of Belize Tourism Industry Association, in conjunction with the Placencia Village Council, is excited to announce...”It's time for Placencia Lobsterfest 2011 – June 24th, 25th, & 26th!... and again this year it's on the “Barefoot Perfect” Placencia beach!! Lobsterfest 2011 will have new and returning excitement of recent years, including the very first Lionfish Tournament with prizes, and our Lobsterfest Raffle with valuable donations to give away to loads of very lucky winners. Dance the night away with the Entourage Movements & DJ Brown Sugar on Friday night, Gilharry 7 Band on Saturday and Sunday nights, and the Panerrifix Steel Band and Entourage Movements entertaining various times throughout the weekend. Challenge yourself with our new and creative games and a Lobster Cook-Off! Eat our delicious Lobsters in every way imaginable; wash it down with a nice cold brew, and stay to watch the Saturday night Fireworks! Getting to Placencia is EASY! You can come by air, sea or land and let us be the first to tell you the Placencia Peninsula road is GREAT now with our newly paved road from the highway to the point. Don’t forget the easy access from across the lagoon either - water taxis travel back and forth all day long from Independence Village. All the more reason for YOU to come to Placencia Lobsterfest 2011. We were not the normal group. 12 people on 3 different private boats with a variety of interests. The gang at Paradise made it all easy for us at a price we were happy with. Helpful on the dock, helpful with all of our gear (3 boats coming from Roatan Honduras we had a lot of gear), packed us picnics for days on the water. The dive team found us a whale shark and showed us a lot of great spots, the rooms were very clean and comfortable. I stayed in the 1 bedroom suite with a kitchen and ocean view and it was absolutely perfect for my wife and I. Enough space for me to work a little at night on the computer and a super view. Everyone was great we loved Alan, Andre at the dive shop, Dalton our dive boat captain, Andrea in the office and the kitchen and house keeping staff. Everyone was super. We will be back next year to do it all again. Its that time of year again, Placencia Lobsterfest! It is right around the corner, book your room today! The rooms are starting to fill up, don't be left out! Remember us? Shannon and Deborah from Texas? Here we are back in our home country trying to adjust to the not so relaxed way of life in the U.S. I never realized how much I would miss the toasty sunshine and leisurely days but most of all the courteous, warm and unbelizeably friendly people of Belize. I want to congratulate you and your exceptional staff at the Paradise Resort for your outstanding customer service and kindness throughout our stay. From the moment we walked into the Paradise (without a reservation), to the time we were dropped off at the airport, you and your staff went consistently above and beyond to make our trip most enjoyable. We truly were treated like a king and a queen. I have to admit, at the time we arrived in Placencia, we were about ready to call it quits and go home. You changed all that for us and I thank you immensely. Not only did we leave with a new found affection for Belize and the people of Belize, we felt as though we had met some real friends and look forward to returning. We thank you again and open an invitation if you ever decide to travel to our part of the world or if there is anything we can do for you. Sunset Pointe in Placencia has won the World Wildlife Fund sponsored Mangrove-Friendly Shoreline Development Challenge! The efforts - both during development and ongoing - taken to help keep the Belizean shoreline healthy and sustainable and to conserve the Belizean mangrove contributed to Sunset Pointe winning the contest. If you prefer to stay in a two bedroom condo while in Placencia, we can book you into a condo at Sunset Pointe. The condo is close enough to allow you all the amnesties of the hotel and the advantages of a condo. Just contact us. Lobster Fest was this past weekend in Placencia, Belize and a large crowd turned out as usual for the event. Large tents had been setup along the beach to host the larger activities and many of the food booths. Placencia also had their annual Lobster Fest Fishing Tournament sponsored by many of the local restaurants and hotels. I had the pleasure of taking part in the fishing on board 'Primal Scream' with captain Alan Stamm. We had two days of fun out near the edge of the reef. 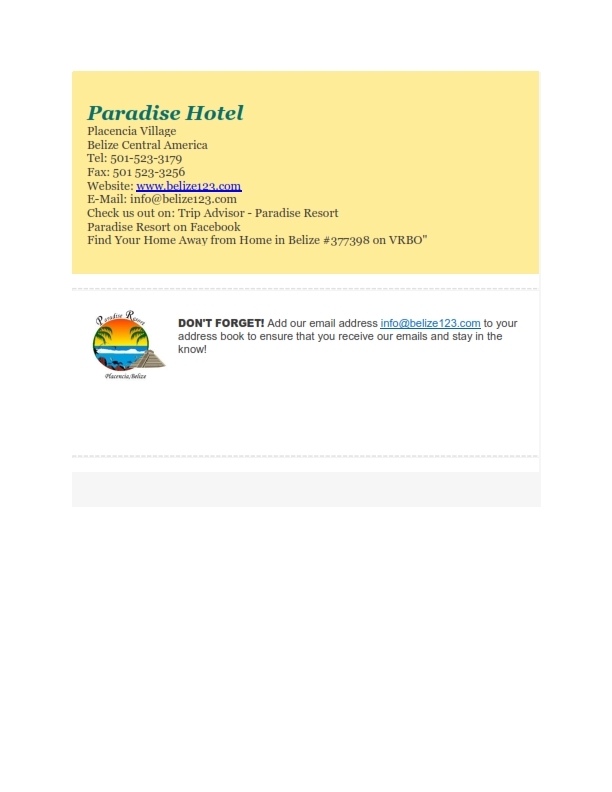 The Paradise Vacation Hotel did not have any major damage by the earthquake and is open for business as usual. TEGUCIGALPA, Honduras - A strong earthquake struck early Thursday off the coast of Honduras, collapsing shacks in Honduras and Belize and sending people running into the streets in their pajamas as far away as Guatemala City. No injuries or deaths were immediately reported. The magnitude-7.1 quake struck at 3:24 a.m. (0824 GMT) at the relatively shallow depth of 6 miles (10 kilometers), according to the U.S. Geological Survey in Golden, Colorado. 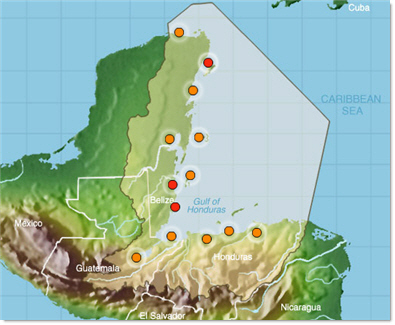 The epicenter was 80 miles (130 kilometers) northeast of La Ceiba, Honduras, and 200 miles (320 kilometers) from the capital, Tegucigalpa. In Belize, people rushed from their homes as glasses and framed pictures crashed off of shelves. At least five wooden houses on stilts collapsed in three towns and a water tower toppled in the town of Independence, local officials said. Electricity was out all the way to the Mexican border. 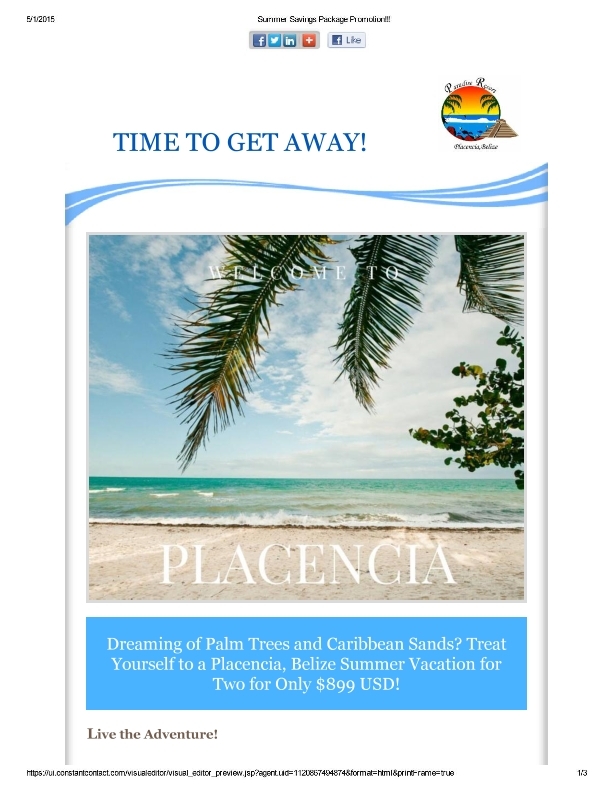 Placencia Tourism: Almost a sweep for the South! At last night's 2009 Belize Tourism Awards, the Placencia Tourism Center received the Best Service Award, Ewort Garbutt received the Tour Guide of the Year Award, and Lola Delgado received the Best Small Vendor Award. Congratulations to everybody!!!!!!!!!!!!!!!!!! All three awards are greatly deserved!